The Swiss were the protecting power during the Second World War. 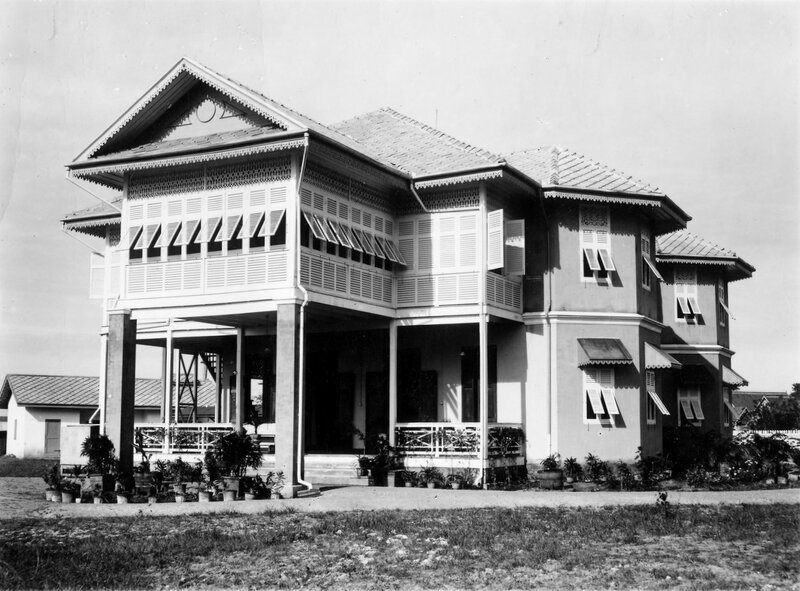 Although some of the compound buildings were taken over by Japanese and Siamese authorities, and there were occasional attempts at pillaging by local civilians, the presence of some Swiss on the compound deterred worse intrusion. The residence was rocked by a bomb during an air-raid on June 5th 1944. The local representative for the Office of Works, Edw. Healey, ‘since regaining my liberty [from internment] on the cessation of the War’, inspected the bomb damage in October 1945. The bomb fell about eight metres from the north-east corner of the building, making a crater about ten metres in diameter. It completely destroyed a septic tank, threw various drains round the building out of alignment, with the result that the basement was now full of water, and the whole of the building showed signs of having been severely shaken, with walls cracked in many places. 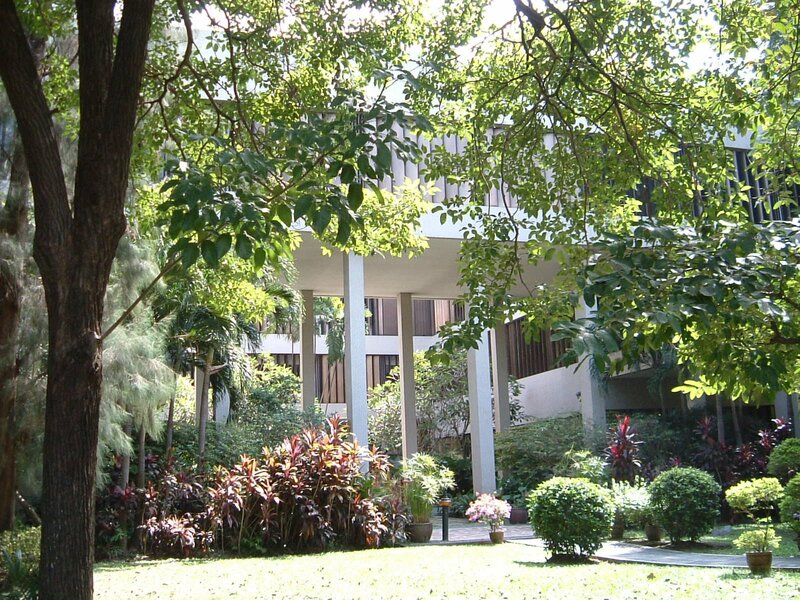 The main buildings had by now been given letters for ease of identification: House A was the residence, designed for a minister but now an ambassador; House B was the originally designated offices; House C the vice-consul’s house; House D the consul-general’s house; and House E the originally designated students’ quarters. Pressure on the space in these buildings increased during the 1950s, and for a time the Information Office was leased on the first floor of 457 Silom Road, a modern 3 storey block. When House B was full to bursting with offices, House E was converted into additional ones. 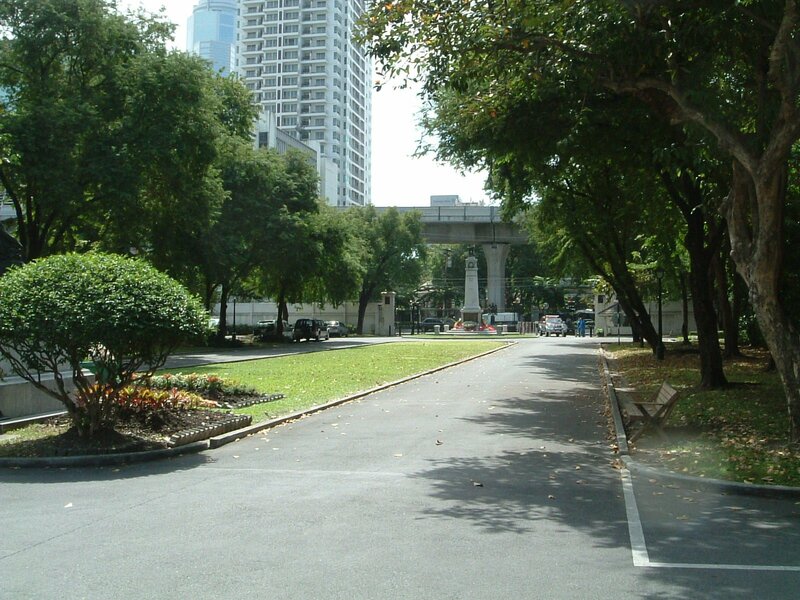 The compound was walled in the late-1950s, which meant the infilling of the klong along Ploenchit Road, and the loss of some fine trees. 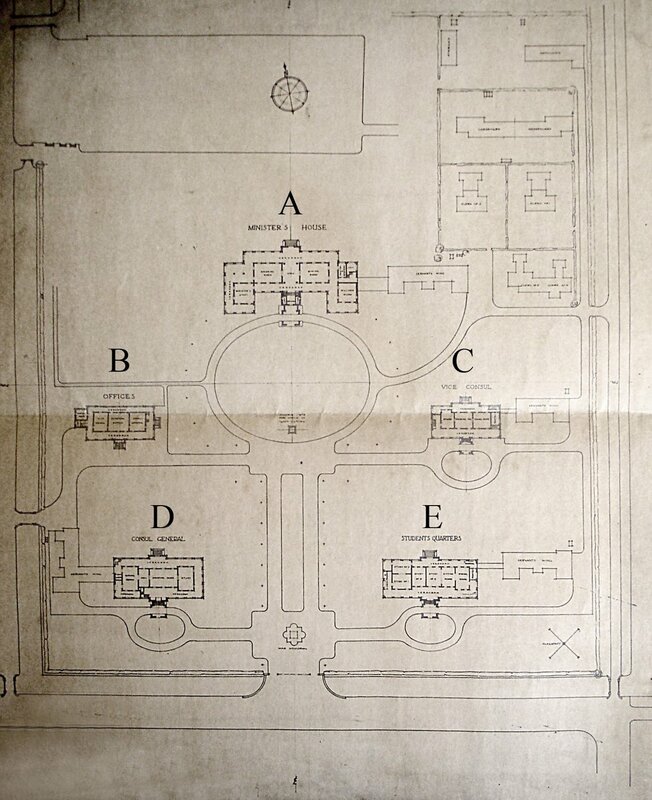 A debate in the early 1960s, triggered by an ambassadorial suggestion that the residence should be considered for conversion to offices, was concluded in 1965 by a review that recommended the retention of House A as the residence, and the replacement of Houses B-E by new buildings. There was no money for this work, nor was there any appetite for disposing of any part of the compound to raise the necessary funds. It was not until the late 1960s that the construction of a single, and reasonably secure, new office building on a site to be found in the compound became inescapable. The site selected was between Wireless Road and the klong, given that the low quality buildings on it were ripe for demolition. The architects, Robert Matthew Johnson-Marshall and Partners, were commissioned in 1969. Their design was a three-storey hollow square plan, with an open ground floor on the pond side, and an adjacent two-storey building for storage and ancillary functions. The building, for which HM Queen Elizabeth II laid a foundation stone during her State Visit in 1972, was completed in 1973. It proved thoroughly satisfactory: efficient in its planning and quietly assured in its appearance, though the elegant external vertical bronze sun louvres lost some of their adjustability as the years went by. Occupation of the new offices enabled Houses B and E to revert to staff residential use, and their conversion to 10 flats was completed in 1980. Houses C and D followed suit, by conversion to six larger flats, in 1987. 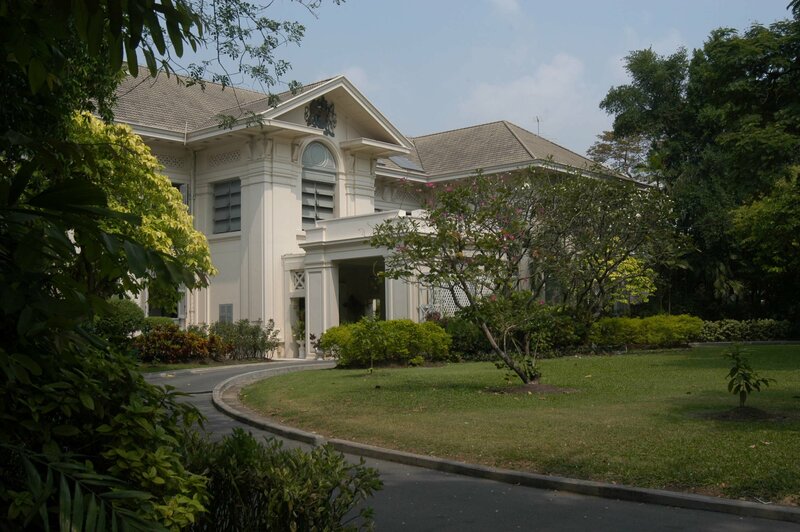 A fine large house and garden, called Collinston, down a 130 metre drive off Sathorn Tai Road and close to the YMCA Centre, was gifted to the British government under the will of a Mrs E Collins in 1953. Although it was about 60 years old and very dilapidated the Treasury agreed to its acceptance. It was converted to a Ladies Mess in the early 1960s, and later reverted to a senior staff house. Robert Matthew Johnson-Marshall and Partners produced a feasibility report in 1973 for the site’s development with 13 units (5 houses and 8 flats). This was not followed up and Collinston was sold in the late 1970s. Siteplan as executed, 1924, (with later House letters). Queen Victoria, with residence behind, 2003. 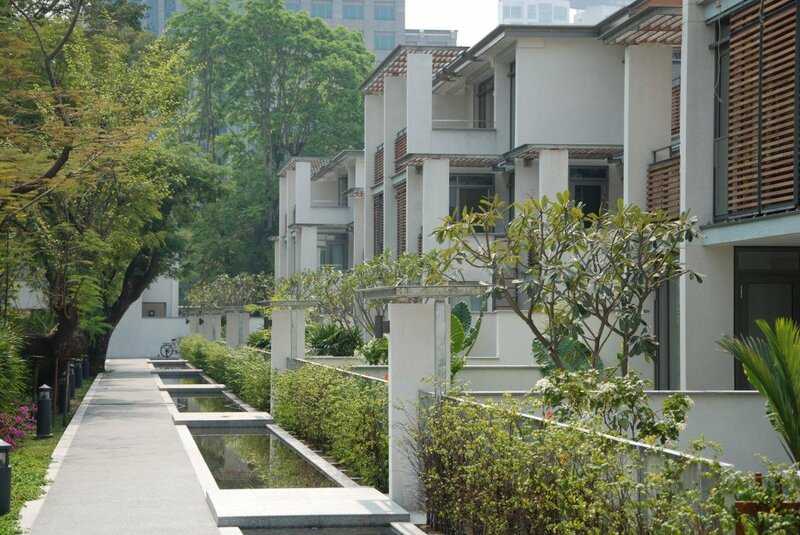 Residence front to klong, 2003. 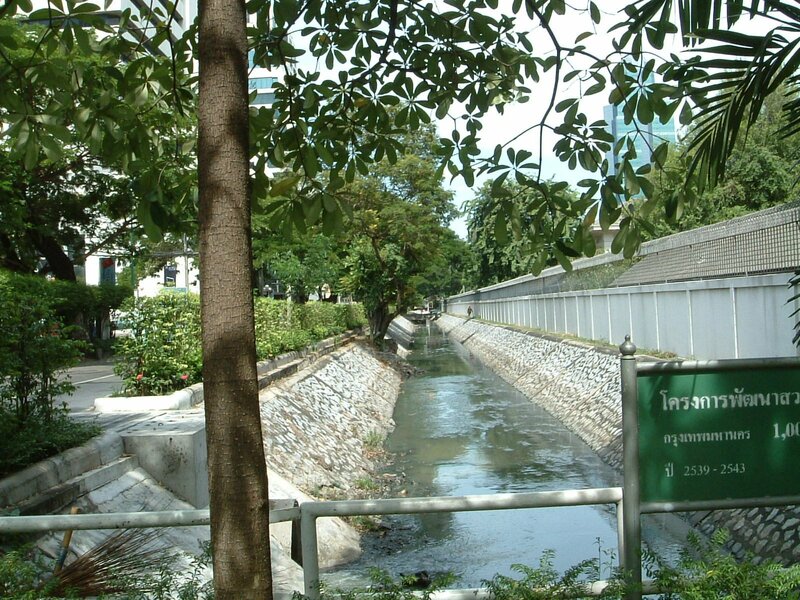 The klong along the west side of the compound, 2003. 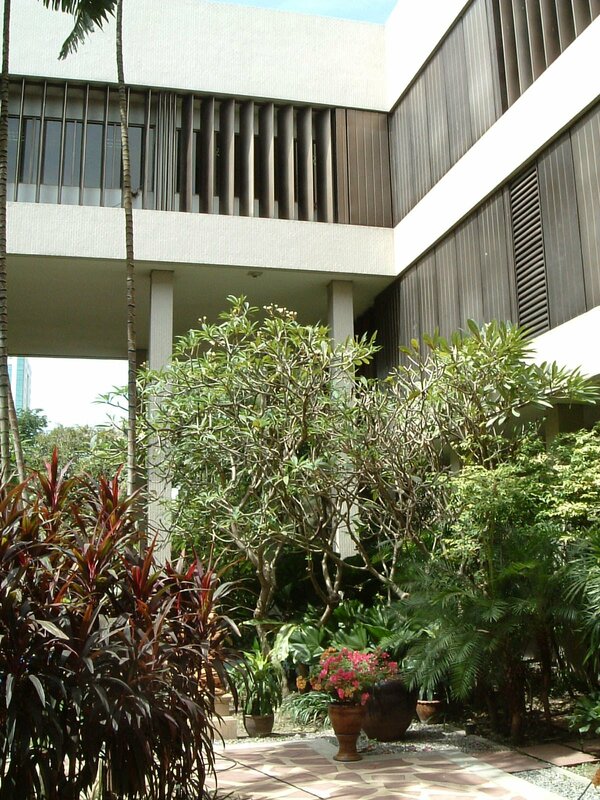 Looking into the offices court from residence garden, 2003. Court at the centre of the offices, 2004. A rationalisation of the compound, to make substantially better use of it and/or to exploit some of its latent asset value, was foreseen as necessary in the wake of the FCO taking over responsibility for the estate from the Property Services Agency in 1983. 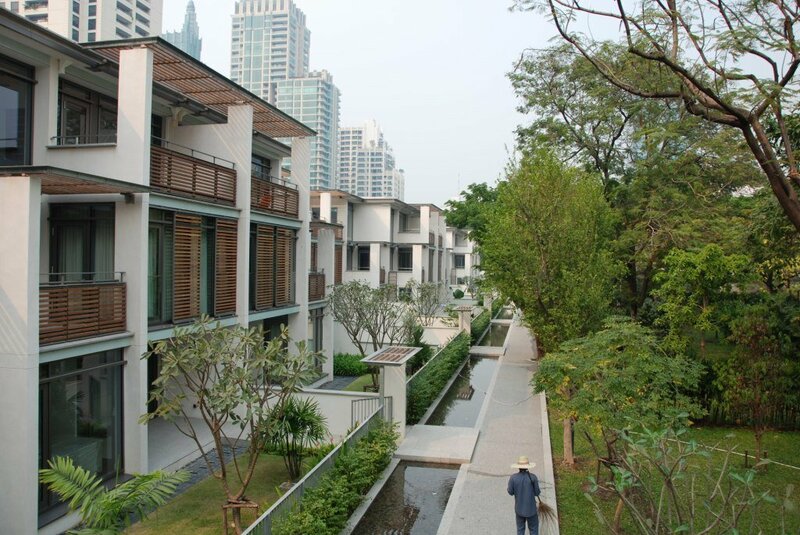 But it presented a huge challenge to the prevailing culture and roused deep feelings in incumbents, compound residents, and much of the British community in Bangkok, and there were many more urgent projects. The financial arguments, however, were increasing and, in 1990, Lord Caithness, Minister of State at the FCO, agreed in principle that the sale of part of the compound should be explored. In June 1992, Brooke Hillier Parker, Surveyors and Property Consultants, were commissioned to undertake a feasibility study, which they delivered in November 1992. 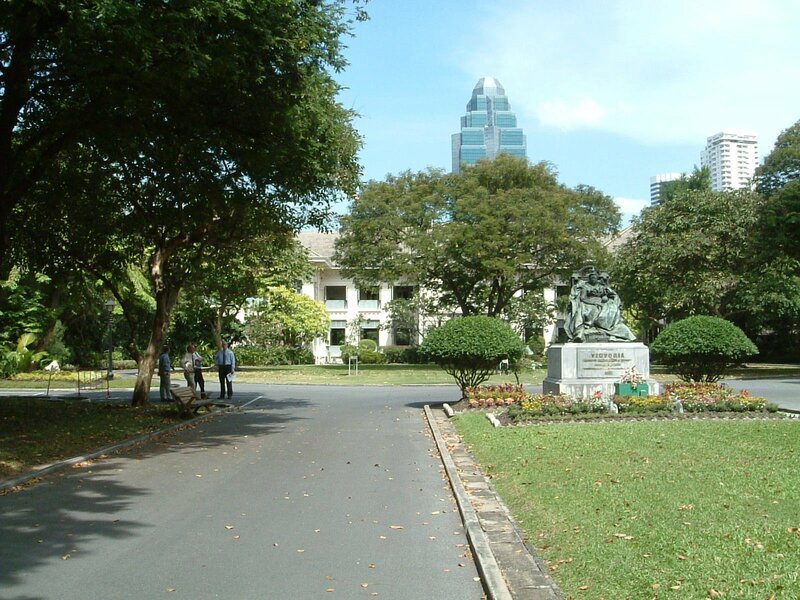 In October 1993, the FCO’s Chief Clerk (head of its Administration) visited Bangkok to see the issues on the ground, and in September 1994 the Secretary of State, Douglas Hurd, inspected the compound both from the ground and the balcony of a nineteenth floor flat next door. In December 1996, the succeeding Chief Clerk visited. Land values were steadily rising during these five years that it took the FCO to come to terms with the case for rationalisation. At one point, the open market value of the compound was put at £150 million. And then, in mid-1997, came the Asian financial crisis: within months, the market crash and exchange rate fall had reduced the value to below £30 million. The debate about what to do, and when, was put on hold for a few years. By 2001, it looked as though the property market in Bangkok, although still in deep recession, was going to pull through. The FCO’s overseas estate adviser was asked to consider the range of strategic ways forward once the market was stronger. His report was ready for discussion in September 2001. 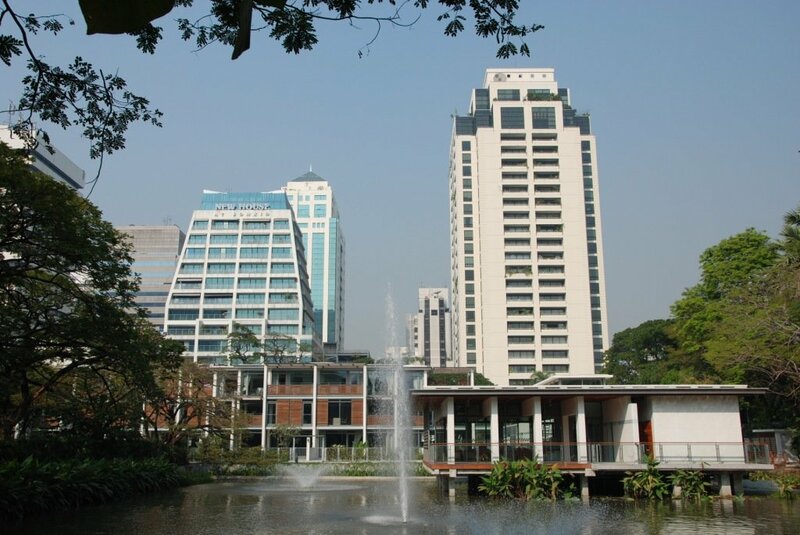 The main recommendation was to sell the front, south third of the compound, facing Ploenchit Road, when the market recovered and to intensify the use made of the retained two-thirds. 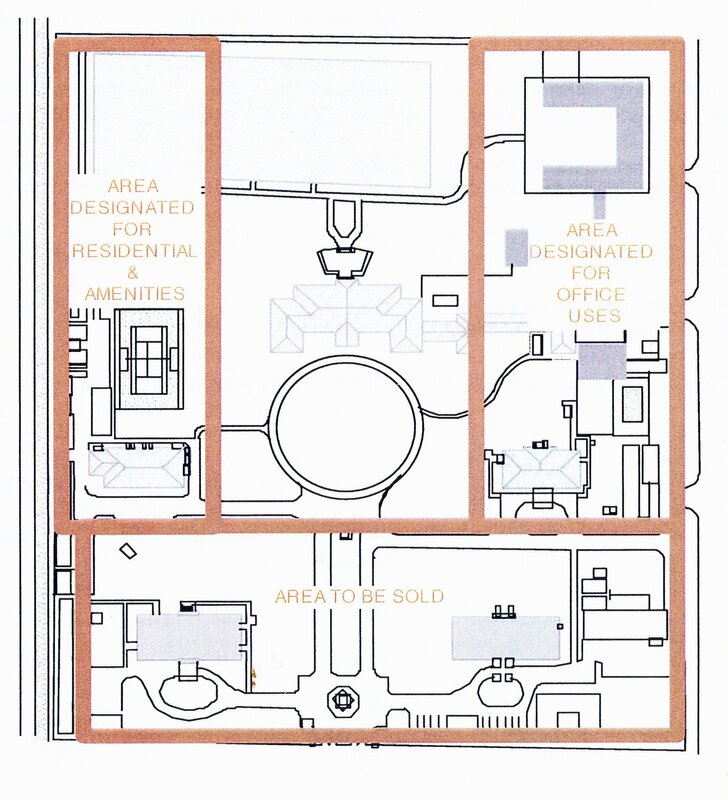 The report further proposed designating the east (Wireless Road) side of the compound for office and support uses, the west side for residential and amenity uses, leaving the wide central strip for the residence and associated uses. This recommendation was accepted in principle, and a suitable project management board was set up to steer all the necessary work. The longest lead activity was producing a design for the more intensive use of the retained compound area, including for re-provision of the flats to be demolished on the land to be sold. A design brief was issued to six architectural practices in January 2004, they attended familiarisation and briefing meetings in Bangkok in February, and competitive interviews to discuss outline designs took place in London in March. 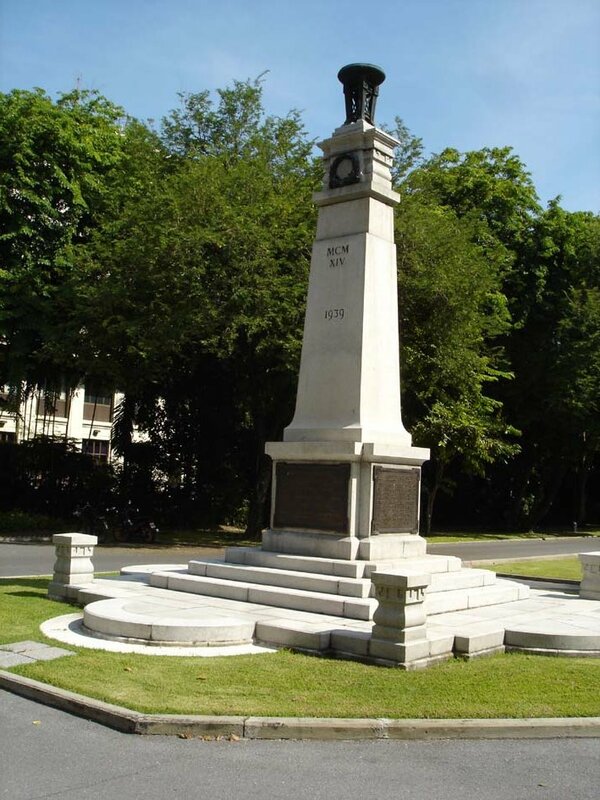 The competition was won by MacCormac Jamieson Prichard (MJR), who were then formally commissioned and other members of the design team appointed. CBRE were appointed selling agents in June 2005, after a selection process involving five bidders. The draft Sale and Purchase Agreement was a complicated document because it contained different options depending on whether it was to be a straight sale or whether prior reprovision of the flats by the purchaser was to be a condition of sale. Bids were received in December 2005 and that of Central Group (which owned the large neighbouring store), without reprovision of the flats, proved to be the most acceptable, in the region of £35 million. The contract was signed by the ambassador, David Fall, on 3 April 2006. Houses D and E were demolished (after removal for re-use of all their fine teak flooring) straightaway in order to transfer a cleared site to Central Group the following month. Central Group completed their new building in 2014. Designed by Amanda Levete Architects, it comprises a seven-storey retail podium below a swooping high-rise tower. It is, fittingly, named Central Embassy. View of land at south end of compound to be sold, 2003. 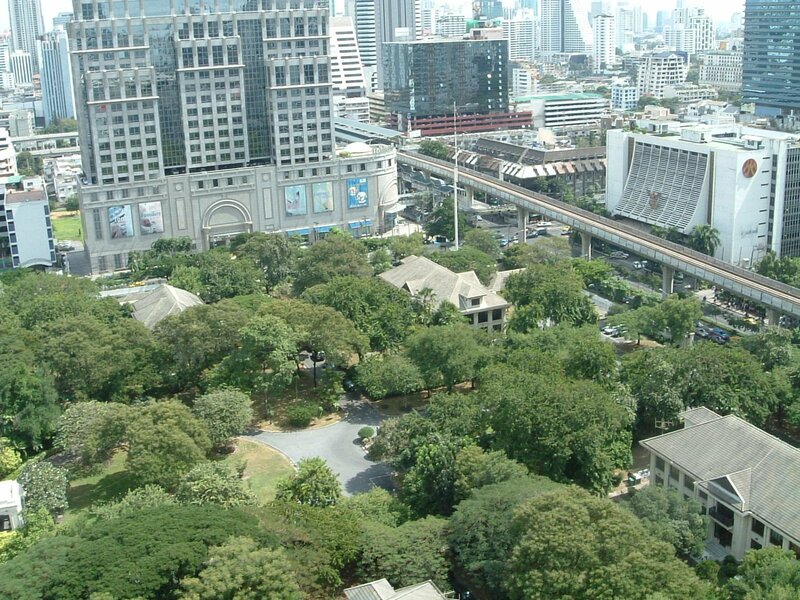 View south from centre of compound, with Skytrain over Ploenchit Road, 2003. 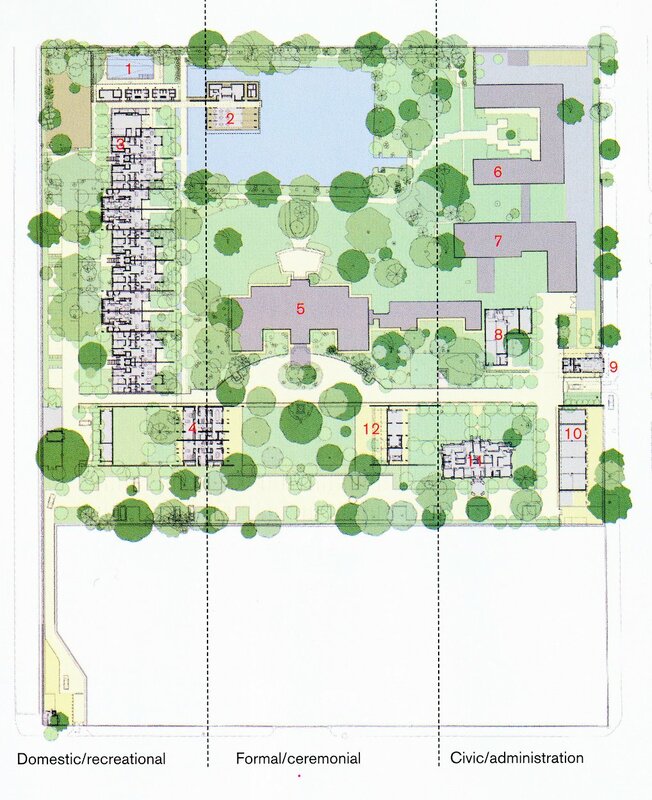 Development proposals for retained compound, 2005. Completed terrace of staff accommodation, looking north, 2009. New terrace looking south, 2009. 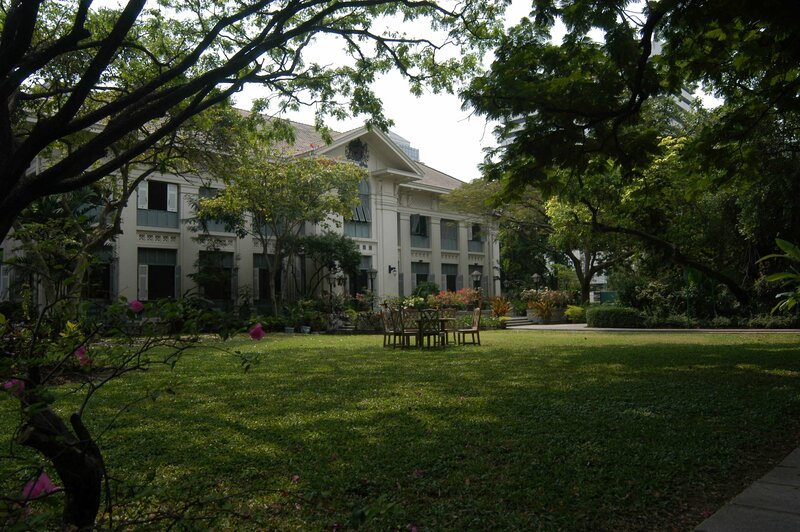 The clubhouse, re-located to the west end of the large klong, 2009.